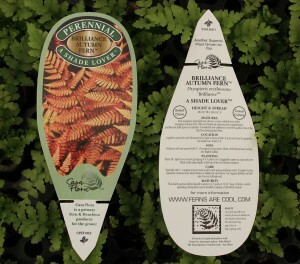 In 2012, Casa Flora redesigned all of our 153 plant tags to give consumers more detailed information on particular varieties of fern and to identify them as native, unique, new, tropical or perennial. Our colorful, oversized tags have a large picture of the plant on one side and detailed descriptions, planting and care instructions on the other and are built to last in the garden for several years. Mobile phone apps are revolutionizing retailing, and it’s common for retail customers to want more information while at a store, nursery, or at home than a label can provide. With this in mind, we’ve added Microsoft Tags (a small box-shaped digital code) to our tags that allow customers to get more information about a particular fern using their smart phone (the free, commonly-used app is available at http://www.gettag.mobi/ or iTunes. These tags help the customer make a purchase decision without a salesperson’s assistance – and with even more accurate information. Soon we aim to link these tags to our new consumer-oriented Ferns Are Green website that will have detailed information on how to grow and care for specific types of ferns.